Something about reading a book puts me to sleep. I’ll admit that I enjoy the excitement of getting a new book. In fact, I’ve read numerous early chapters of a book I really want to read, but no matter how good it may be, I always lose interest and end up with yet another book that had great potential, but will likely never get entirely read. It’s been this way my whole life. Listening to audiobooks almost feels like cheating. In fact, I just finished my first one. 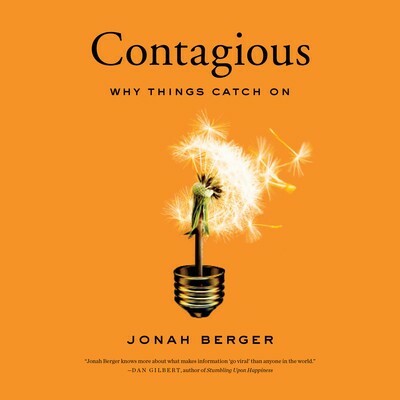 In what felt like a breeze, I was able to listen and absorb some excellent insight from Contagious: Why Things Catch On, written by Jonah Berger and very well narrated by Keith Nobbs. One thing I found challenging with listening to audiobooks, is that you can’t stop and reflect as easily. Fortunately, this book had enough meaningful insight that I took the time to pause, even rewind to scribble quick notes on what makes things popular, why people talk about certain things more than others and what makes content go viral. The world’s wealthiest person has the most money. The world’s most interesting person has the most social currency. People share things that make them look good to others. To mint social currency, one must find inner remarkability, leverage game mechanics and make people feel like insiders. Social currency gets people talking. Triggers KEEP people talking. Triggers relate to memorable things. By creating new links to prevalent triggers, we can lead people to talk, choose and use. Top of mind equals tip of tongue. To go viral, a large amount of people must share the same content around the same time. 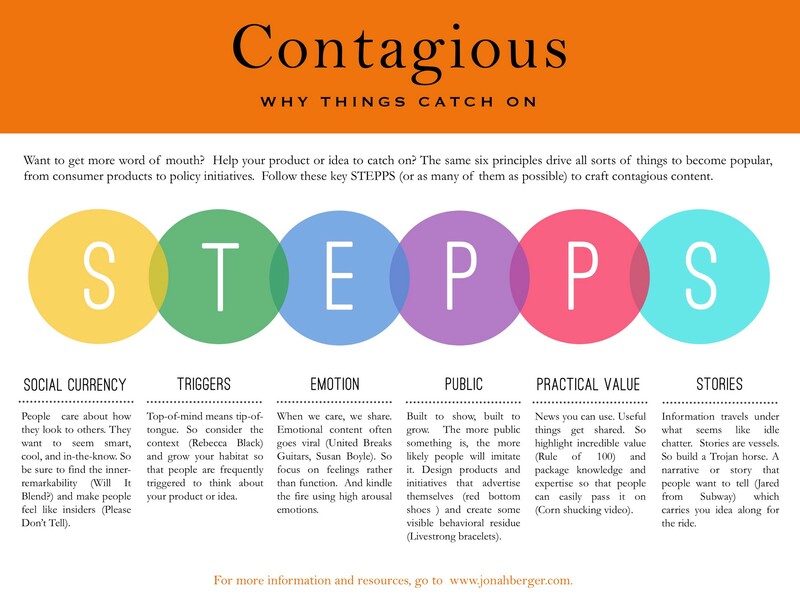 Interesting and useful content is contagious. When we care, we share. Different emotions evoke difference responses to content. Science creates the sense of awe, which is very powerful. Creating public observability is key. SEEING others do something makes people more likely to do it themselves. When sending samples, send multiple items to encourage sharing. If something is built to show, it’s built to grow. News you can use plays into social currency and is naturally contagious. Rule of 100: Use percentage discounts for pricing under $100, while dollar amounts are more effective for discounts on things over $100. Practical value is about helping others. Build a Trojan Horse. A story that is easy to like, but one that also packs a very meaningful messages inside. Create a story where your message simply must be shared. Videos, Crafting Contagious Guide & Contagious Discussion Guide are also available. To ride my wave of knowledge-gaining momentum, I have two new audiobooks I’ll be listening to next. Good to Great by Jim Collins and Choose Yourself by James Altucher. Any other recommendations? Feel like fueling this fire? The art of connection to accelerate others.